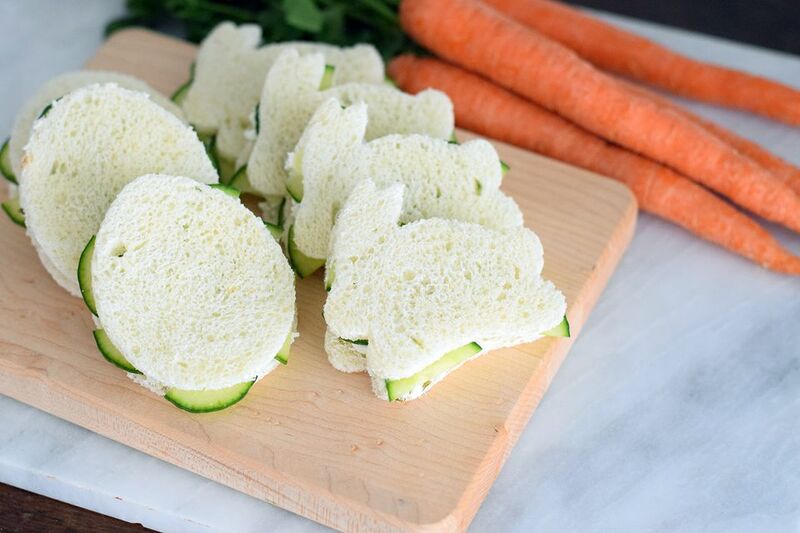 Does some bunny special you know need these adorable cucumber sandwiches this Easter? Whether you're hosting Easter brunch this year, going to a friend or family members house, or having a spring-time tea party, these cute little sandwiches are a great addition to your regular spread. Requiring absolutely no cooking and very little prep time, all you need is a cute bunny, egg, or other Easter-themed cookie cutter. The very thinly sliced white bread works best for this recipe. Normal bread thickness will be too heavy and clunky for this sandwich. However, if it is all that you have it will work in a pinch. If you are unable to find a garlic and herb spreadable cheese (usually found in the deli cheese section of the grocery store) you can always substitute softened cream cheese, a teaspoon of garlic powder, and some chopped parsley and chives. Just make sure to add a little salt and pepper too if you are going that route. Use a bunny and/or an egg cookie cutter (or the shape of your choice) to cut out the bread from the thinly sliced bread. If you are using two different shapes, make sure to cut out an even number of each shape so that you aren't left with extra shapes that don't match up. The spreadable cheese should be very soft and easy to spread, but to make it even easier, take it out of the refrigerator about 30 minutes before you are ready to use it. Once it has slightly softened, combine it with the finely shredded carrot. Cut the English cucumber in half lengthwise. Use a mandolin, or similar vegetable slicer, to slice the English cucumber on the thinnest setting, usually 1/16-inch. You can also slice it with a very sharp knife. The thinner the better! Spread a tablespoon of the cheese mixture between two pieces of the cut bread. Make sure to do it on the mirror side of the second slice of bread so that they will line up properly when you place them together. Place 5 to 6 cucumber slices on top of the cheese mixture on one of the slices of bread. Then top with the other bread slice, making sure to line it up properly with the first bread slice. Repeat with the remaining bread slices. Store them in the refrigerator for up to 1 day before serving. Just make sure to tightly wrap them on a platter if you are waiting to serve them so the bread will not become dried out.